Tactilemusic-pad Musical Touchpad: Software development with presently available touch-pad products? Software development with presently available touch-pad products? As I continue to research touch sensitive device technology and presently available touch-pad devices in the market, I feel the best way to proceed in the creation of the tactilemusic-pad, is by experimental software development and testing with touch-pad devices that are already in the market. Although it would seem that the present devices lack some of the features we need for a tactilemusic-pad, it seems the Synaptics drivers they presently use already have the data structures setup to be used with multi-touch and multi-pressure data structures. So even without pressure sensitivity at this time, we should be able to start to develop the software to convert the structures returned into midi and other formats that will be used to drive and control sound generation software that is already available in Linux. As we know from past history normally it is software that lags hardware. So by getting started now even with what we have we might not figure out how to use the valid data in the structures to drive software synthesizers, before the release of new products that have more valid data available to play with. My present choice of a device if we choose to do so would be the Logitec T640 touch-pad that sells for a reasonable price of from about $30 - $50usd at amazon.com as seen bellow. 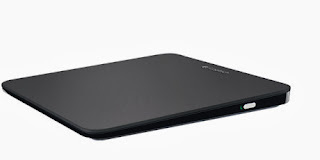 As I do see evidence on the web of others in Ubuntu and Linux have had some success with this device as a standard touch-pad to be used in place of a mouse. I have also analyzed the present source code for the drivers in the Linux kernel archives to get a basic understanding of what might be possible to try if we had a T650 device in our possession. My research so far on the Logitec T650 make it unclear as to what chip is used in the T650 device but I do see comments on the web that Logitec deals with Synaptics and I also see from the Logitec Linux driver source that it uses the Synaptics code when used in a Linux system. So I assume that this device must have some older version of chip set prior to the Series 7 Synaptics that don't have the pressure sensitive feature yet but they do claim to be multi-touch. I also note comments I've read in some articles of something about asking Synaptics to release the source code as open source to allow multi-touch feature to be active in linux. I'm not sure how this can be as when I look at the code it does indeed include multi-touch in the data structures. So what are they asking for? Maybe the firmware in the Logitec device is limited with no multi-touch when used with linux? I'm not really sure what this might mean and if anything that they speak of is really valid. I can also bet that in the near future that Logitec and maybe others will be delivering products that also use the presently unused portions of the Linux kernel code to provide pressure readings at each point of contact when they integrate the new Synaptics chips into there products. So one question is should we just wait for a new Logitec product to appear with all the needed features or purchase the present and start development. I would be glad to start if someone donated a sample Logitec T650 or other unit, but my resources are very limited and I might otherwise sit and wait for what's really needed with Series 7 Synaptics technology before I extend my finances.